Admittedly I have never eaten Egyptian food, so I have no reference point for good Egyptian food. But I do know food, and the food at Al Masri is good. 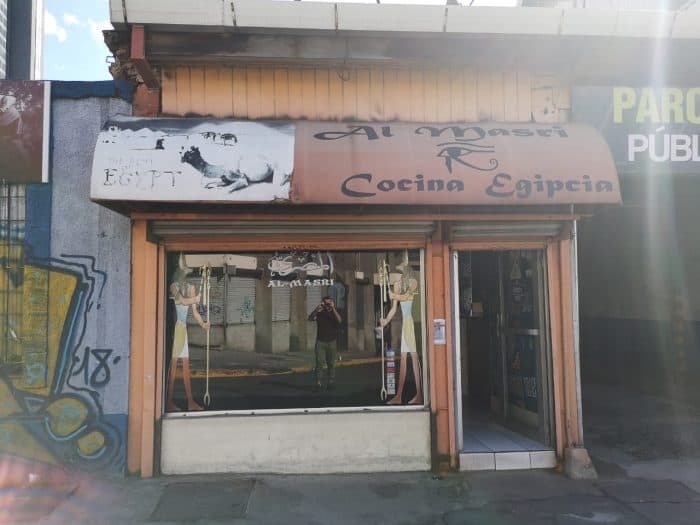 I’m pretty sure it’s authentic too since the owner, Mohammed Hussien, only moved to Costa Rica from his native Egypt six years ago. Mohammed’s always in the kitchen himself, making sure the food comes out in true form. It really seems to be a labor of love and one that keeps him connected to home. Even though Mohammed is on the other side of the planet, at least the smells and tastes at Al Masri are familiar. Mohammed first came to Costa Rica from Cairo to work in kitchens at some of Costa Rica’s best hotels. Then he went into business for himself and opened one of the, if not the, only Egyptian restaurants in the country. This is truly a one-of-a-kind gastronomic offering in Costa Rica. Al Masri is literally a hole in the wall just west of the INS building in the Barrio Amon district of San Jose. 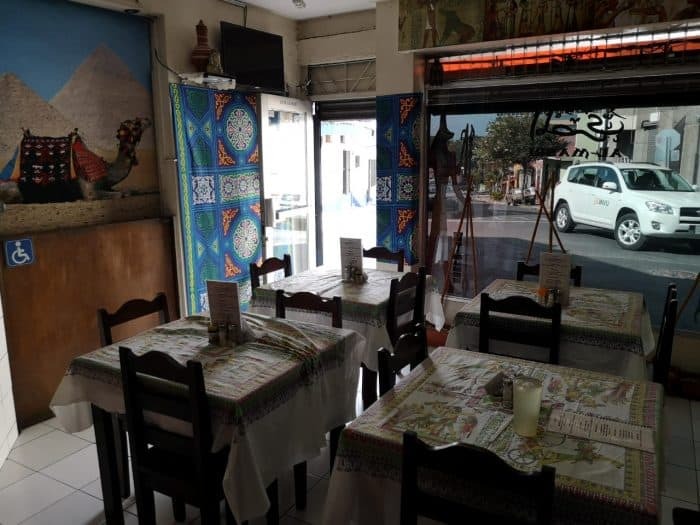 An area known for its beautiful architecture, old buildings and homeless people, the restaurant occupies a small space along Avenida 7 (near Calle 13). The restaurant has only six tables, for a combined total of 16 seats. I was the only customer on my visit, but I can confidently say that if there were 16 people dining at once, it would be uncomfortable. I was very comfortable, but I am told they can get busy in here on weekends. When it comes to food, I bet you couldn’t find the same menu being served anywhere within a few thousand kilometers. The five-page menu is split into categories like appetizers, salads, traditional plates, grilled meats, soups and sandwiches. Despite the small size of the restaurant, Al Masri has quite a few options. The waitress, who was friendly if not a bit shy, was happy to recommend me a vegetarian platter to start, followed by a plate of grilled meat skewers and rice. I followed her recommendation, without second-guessing. 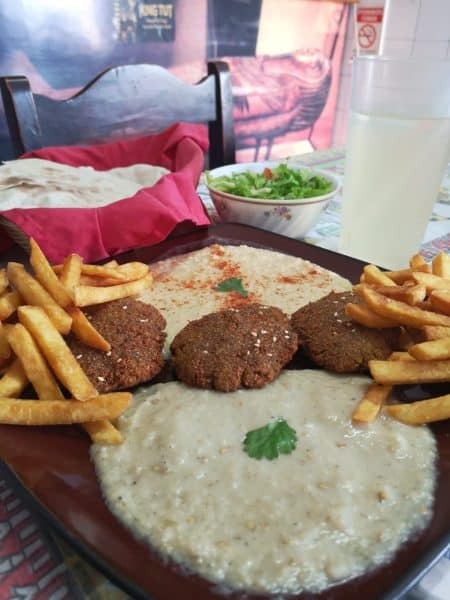 The vegetarian platter is called Mezcla Almasri and included a portion of hummus, babaganoush, falafel, pita bread, salad and french fries. Everything tasted fresh and was served in generous portions. I actually couldn’t finish it all, as I was saving myself for the main course. When I ordered the grilled meat plate, the waitress confirmed that I wasn’t in a hurry. She warned me that it’s prepared to order and could take a while. I actually wasn’t in a rush, but it didn’t take too long for the food to hit the table. But I guess it could be a real concern when they’re full on weekends. Anyways, take your time. Slow down. Enjoy it. 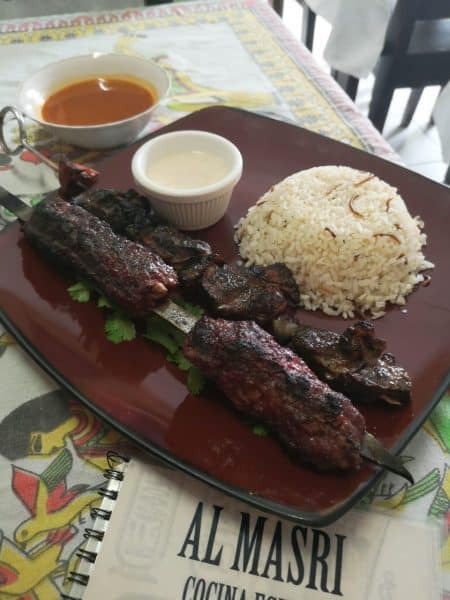 The Mezcla Kebab, as it is called on the menu, included one skewer of kofta (ground beef) and for an additional 1,000 colones, I got a second skewer of lamb meat. Both were delicious and you could really taste that flavor that comes off of the grill. The meat came with sides of white rice, tahini and a plate of beans. This time I ate it all. I cleaned that plate. It was really delicious, especially when you consider the prices. On my next visit, I have my eyes on another two of the traditional Egyptian dishes on the menu; Hawawshey and Kushari. Hawawshey is pita bread stuffed with minced meat with of mix of different herbs, spices and onion, kind of like a pastry or perhaps an Egyptian empanada. To be eaten with your hands, like a sandwich. Kushari is a strange mix of rice, spaghetti pasta and lentils with chickpeas and tomato sauce amongst other ingredients. It is difficult to describe but when you eat it, somehow it makes sense. Or so I am assured. I look forward to trying it. They serve Egyptian desserts, as well. Al Masri is very cheap, or put better, a great value meal. Dishes average around 4,000 colones (about $6.5) and some items, like sandwiches, cost less than 2,000 (about $3). This is a spot you can go to fill your stomach without spending a lot of money. They don’t sell alcohol either, which always keeps my bill down. I had Egyptian Lemonade for 1,200 colones (about $2) and it was refreshing, but a bit sour. I couldn’t figure out what was Egyptian about it, but I do love lemonade. You can also get coffee, tea, or water. 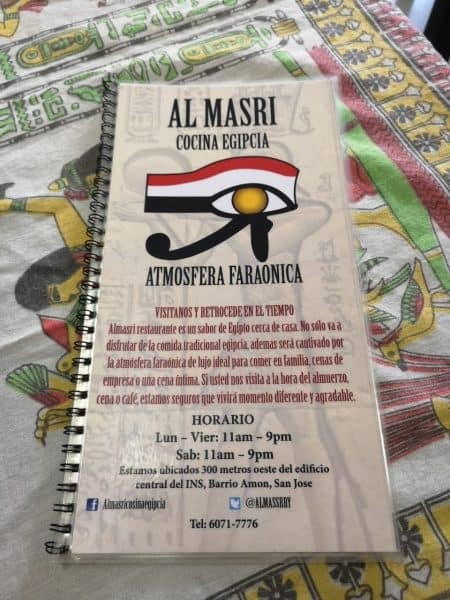 The front cover page of the menu claims that Al Masri doesn’t just specialize in authentic Egyptian food, but also showcases a Pharaonic theme that will transport you back in time. I can imagine what Mohammed originally had in mind when he dreamed up this concept but in its execution, I assume perhaps for budget restrictions, it missed the mark. 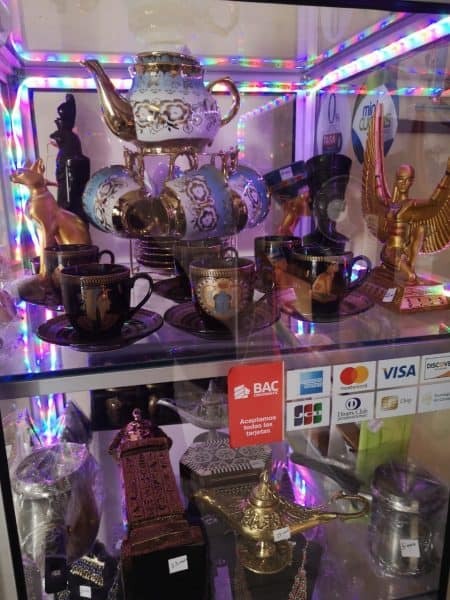 While there are some neat pyramid, mummy and pharaoh themed decorations scattered around the restaurant, including photography and even a glass display case of imported souvenirs (available for purchase), interior design is not a draw at Al Masri. The Egyptian music playing was a nice touch, though. I enjoyed listening to it while I ate. But let’s be clear, the only part of this restaurant that is truly an experience is the food. And that’s good enough for me. 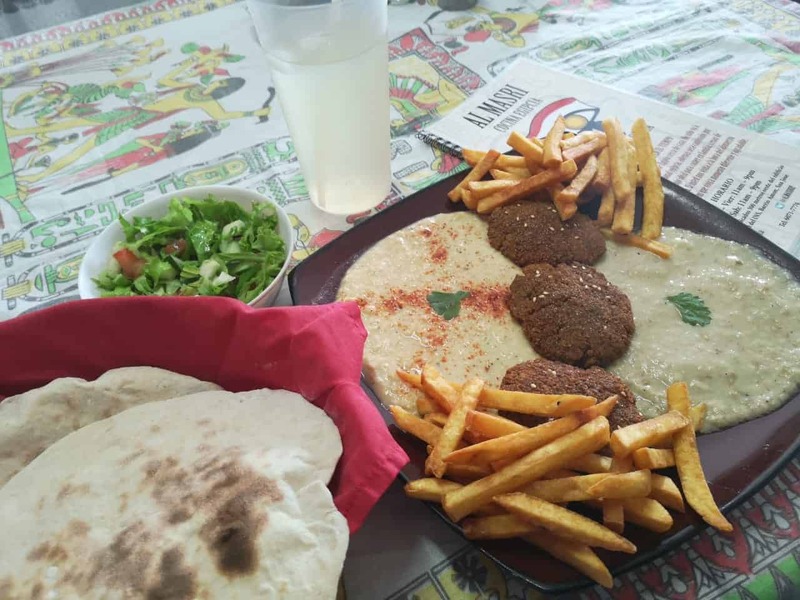 Al Masri is open from 12 p.m. – 8 p.m. every day of the week except for Sundays, when they close. Credit cards are accepted. Vegetarian options are available. Conveniently located directly beside the restaurant is a public pay parking lot, and pay street parking is also available nearby. Search “Al Masri Restaurante” on Waze or Uber to arrive conveniently.